Scrapping with Liz: 5 More Pages Scrapped! Besides my weekly double page spread I was able to crank out 5 pages this week. I'm sticking to my Scrapping Fast model and it's working out great, even on the busiest of weeks. These first three pages are more pages for Matthew's Album. Pictures of our second day together. Look at him holding my hand! And eatin' that doughnut. I love that boy. Cheri of Dream Big Designs just released this Imperial Palace Kit. I couldn't resist scrapping with it. So I pulled out some older pictures that hadn't been scrapped yet. Lydia's 4th b-day. Last but not least. 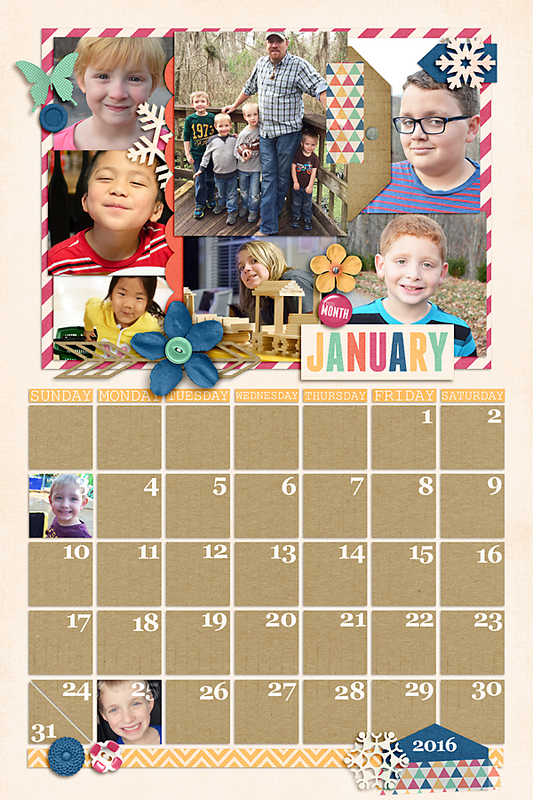 I'm participating in the 'Planning Ahead' Challenge over at Scrap Orchard. Our goal is to scrap one calendar page a month and at the end of the year we'll all be ready to order 2016 Calendars. Here's my January Calendar. It's going to be for my mom so I'm trying to include pictures of all the grands. Kind of hoping my Mom doesn't see this or her Christmas present might not be a surprise. There you have it. I wonder what I'll get scrapped this week. You're on a roll! 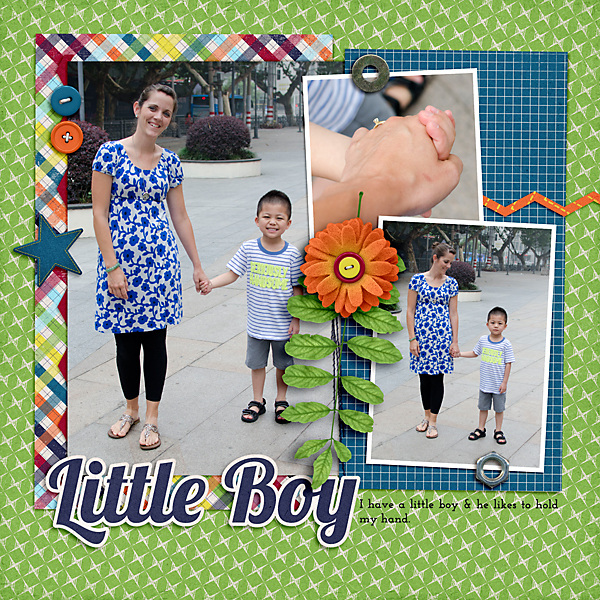 I love all the bright colors, and that is so sweet about holding hands. :) I've been working on pre-designing a baby album. It is tough to find baby themed cards that I like (as of right now, I'm planning to do a modified Project Life style digital photo book). I want bright colors, and they are just not out there. I could make my own, but I want it to be quick and easy. Oh well... I have the Becky Higgins Baby Edition for Him, and I think I'm just going to go with that. I plugged in some old pictures that I thought would look awful with the pastel cards, but it actually looked pretty good. Shows what I know. Ha! :) The sad part is that I'll probably get the album all ready to go and then change my mind and redesign the whole thing. :) Have fun scrapping fast!